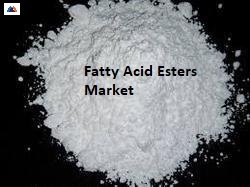 11 February 2019: Global Fatty Acid Esters Market was valued at USD 1,830.2 million in 2014 and is expected to reach USD 2.44 billion by 2022, with a CAGR of 4.6%. Fatty Acid Ester market is expected to witness robust growth over the forecast period owing to the increasing demand in the food industry, cosmetics, and personal care. In the food industry, Medium chain triglycerides (MCT) are used in weight loss programs as they have fat-burning properties and low calorific content. In addition, FEAs such as polyols esters and emollient are gaining importance as they have a positive impact on the growth of bio-based and natural ingredients in personal care and cosmetic industry. The natural ingredients used in lotions and creams for infant care, hair, and skin, helps in substituting synthetic and toxic chemicals which are harmful for the personal use. Also, the fatty acid ester from natural ingredients are inexpensive as compared petroleum-based and synthetic chemicals. The manufacturers and consumers are progressively adopting these products so as to prevent from high production cost and various climatic changes. The rising obesity and growing concern related to beauty and fitness are the factors projected to stimulate the market growth. Moreover, the regulatory policies and escalating consumer awareness level regarding bio-based products and polymers are the key factors presumed to drive the development of this industry. Technological advancement is one of the vital factors expected to increase the efficiency and production of FEAs owing to genetic engineering. Furthermore, the evolving fatty profiles of vegetable oils such as sunflower oil, palm oil and canola and the introduction of high-yielding crops are estimated to escalate the production of FEAs. The increasing entrenched oil consumption due to the proliferation of processed fried foods is anticipated to drive the demand in food industries. In addition, rising living standards and declining edible oil prices are other drivers projected to fuel the growth of global fatty acid ester market.The market on the basis of the product is segmented into isopropyl esters (isopropyl myristate and isopropyl palmitate), glycerol monostearate (GMS), medium chain triglycerides (MCT), and other esters such as sucrose, polyol, and emollient. GMS is expected to hold the largest market share owing to the high usage in food industry mainly for frozen foods and ice creams as thickening agent and emulsifiers. MCT is estimated to be the fastest growing segment owing to the low-calorie content. Furthermore, the reduced chain length of the product promotes quicker metabolism and contributes to accelerating the demand for weight loss programs across the globe. Isopropyl palmitate is expected to grow at a significant pace owing to the rising demand in the cosmetic industry. The use of fatty acid ester in various applications is presumed to boost the market growth. The applications include surfactants & detergents, personal care & cosmetics, food processing, lubricants and pharmaceuticals and construction industries. Personal care & cosmetics is projected to hold the largest market share owing to the increased functionality and eco-profile product. Therefore, resulting in high demand in niche applications such as water solubility, thickening, and anti-irritant agent. Food industry is estimated to have tremendous growth in coming six years owing to the increasing consumption of these esters in various processed foods. Geographically, the key regions identified in this industry are North America, Europe, Asia-Pacific, Latin America and the Middle East and Africa. North America is estimated to dominate the market followed by Europe owing to the high consumer awareness level regarding beauty and fitness. In addition increasing adoption of MCT is projected to have a positive impact on the market growth. Asia Pacific is expected to witness the fastest growth over the decade owing to the rising disposable income in this region. This has led to increasing consumption of fatty and processed foods. The key players in this industry include DuPont, P&G Chemicals, Evonik Industries, Cargill Inc., Estelle Chemicals Pvt. Ltd., Fine Organics, Stepan Company, KLK Oleo, The Seydel Companies and World Chem Industries. Other prominent players are A.B. Enterprises, Zhengzhou Yi Bang Industry Co. Ltd., Metroshen International Corporation, Faci Asia Pacific Pte. Ltd, and Oleon N.V. The market is highly competitive in nature as the players in order to increase their market share are adopting certain strategies such as new product development and collaborations. In April 2016, according to the journal of food science, a series of novel I-ascorbyl fatty acid esters were synthesized by catalization of Novozyme 435 using electrospray ionization mass spectra, ultrasonic irradiation, nuclear magnetic resonance and spectroscopy. In 2014, the FDA approved Epanova (omega-3-carboxylic acids) manufactured by AstraZeneca. The drug is used for the treatment of hypertriglyceridemia containing fish-oil derivative free fatty acid.